NFL title in '¬Ü56. Both coaches would go on to NFL stardom, Lombardi with the Green Bay Packers and Landry with the Dallas Cowboys. But it was during their years as Giants coordinators that they developed the coaching philosophies they would employ later in their careers. For Lombardi, it was the reliance on the running game that started with Frank Gifford and would continue in the '¬SPackers Sweep'¬ days of Paul Hornung. For Landry, it was his own invention of the 4-3 defense that led to the '¬SFlex'¬ defense of his Super Bowl winners in Dallas. How they developed their ideas, and how they were allowed to implement them, was a testament not only to their genius, but Howell'¬"s willingness to let them handle the strategic matters while he looked after the big picture. 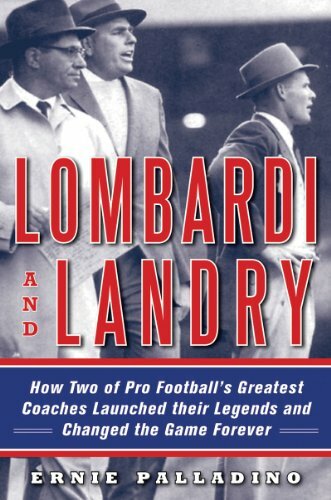 In Lombardi and Landry, veteran sportswriter Ernie Palladino takes an in-depth look at these two legends'¬" formative years in New York, offering up a vivid, revealing portrait of two brilliant coaches just coming into an understanding of their formidable powers.